Contact Staci Donegan for more information or to arrange a showing. 912-247-2052 or staci@stacidoneganrealestate.com. Savannah’s legendary Wedding Cake Mansion offers the ultimate in luxury in the heart of the city’s National Historic Landmark District. 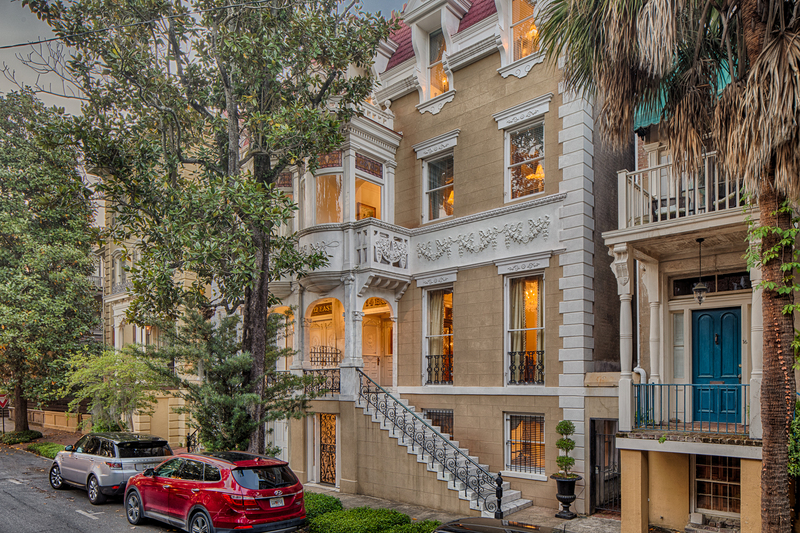 Overlooking picturesque Monterey Square, this iconic 5-bedroom, 5.5-bath home has an elevator and boasts distinctive architecture as well as magnificent interiors defined by sumptuous details, picture-perfect renovations and sophisticated appointments. Nestled on a quiet street just steps from Bull Street and Forysth Park as well as the city’s finest dining and shopping, the three-story Wedding Cake Mansion boasts unique ornamental ironwork, rounded bay windows facing the square, spectacular city views, decorative plasterwork and intricate moldings. Bright, airy interiors with high ceilings, a large skylight and plenty of natural light create an inspired cosmopolitan environment that’s ideal for relaxing or entertaining. Originally built in 1869, this stylish Second Empire Baroque treasure has been lovingly restored to its former glory and has earned historic certification for its period-appropriate renovations. Ornate stained glass details and antique crystal chandeliers add to the ambiance of this breathtaking sanctuary. Dripping with glamour and Old-World style, the grand double parlor sports high ceilings, hardwood floors, silk curtains, crystal chandeliers and elegant appointments. The gourmet kitchen features a commercial-grade Electrolux gas stove, Sub-Zero refrigerator with Parisian-inspired detailing, farmhouse-style sink, lighted glass-front cabinets and a large dine-in area. French doors open to a private, screened, covered veranda. On the second level, a spacious master suite with soaking tub and stone shower offers commanding views. En suite bedrooms include fireplaces, transom windows and lavish baths with top-quality stone and marble. The third floor is home to a private suite with a fully equipped kitchen, bedroom, full bath, ample storage, veranda access and dramatic city views. Additional Wedding Cake Mansion highlights include Italian mosaics, hand-painted murals and handcrafted stained glass. Antique vanities, original decorative fireplaces, custom window treatments, carved plaster moldings and sculpture niches combine to create a rich atmosphere of European-inspired elegance in the heart of historic Savannah. A brick-accented courtyard, second-floor screened porch and third-floor veranda offer ideal outdoor spaces to relax. A two-bedroom, two-bath garden suite on the ground level and a one-bedroom, one-bath carriage house offer ample space for guests. These comfortable spaces complement the expansive main home and can double as income-producing vacation rentals.